thriller played at the Providence National Stadium, Guyana yesterday. West Indies opener Kieran Powell stroked a solid 61 while Ashley Nurse who grabbed 4-62, returned to play a beauty by ending with 34 from 15 with five fours and one six to help guide his team home. top-score of 88. Opener Ahmed Shehzad batted classily for 67 while the veteran Shoaib Malik hammered a bruising 53 from 38 with six fours and two maximums as the visitors made full use of a new batting surface at Providence. Apart from Nurse, skipper Jason Holder (1-58) was the only other wicket-taker for the West Indies. Left-arm speedster Mohammad Amir drew first blood for his team when Chadwick Walton (07) was out caught by Wahab Riaz. a maximum, was knocked over three short of fifty. lusty blows, hitting four and a six shortly after walking out to the middle, helped raise the West Indies team 100. The left-handed Powell brought up his fifty with a boundary off Amir which also raised the half-century stand between him and Hope. Riaz, reintroduced into the attack from the Media Center End bagged the wicket of a set Powell who was outfoxed by a slower ball from the pacer which he spooned straight to Akmal at mid-off. Hope became Khan’s first wicket the right-hander was caught by Sarfraz for 24. 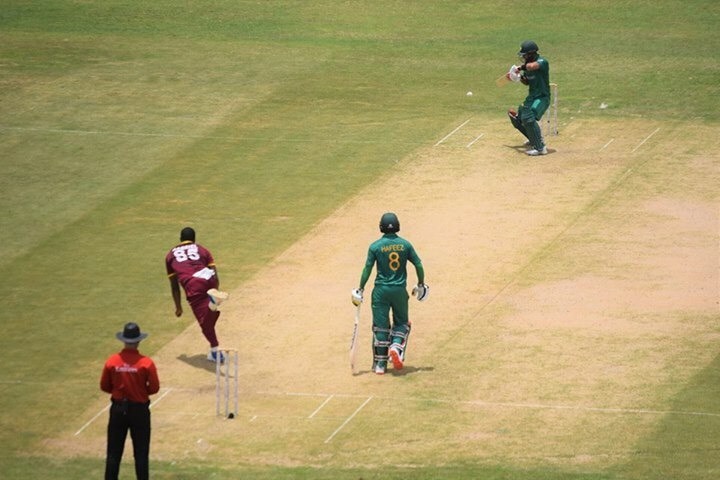 With a required run rate of almost 10.00 per over and the final 10 overs to be bowled, Johnathan Carter (14) and Jason Mohammed were present when the Windies raised their 200-run mark and the pair found the boundary a few times which was needed by their team as the end of the innings approached. four a four as the home team took their deficit below 100. Mohammed then hammered Riaz for a few fours, one of which raised a brutal fifty from just 31 deliveries as the hosts seemed to be fancying the tight chase. Amir then managed to pull things back with the wicket of Carter who gave Riaz a simple catch to put the West Indies on the backfoot at 231-5. Mohammed cut loose on the bowling smashing sixes and fours at will as the West Indies required 56 from the final six overs. The Captain Holder (11) then attempting a big shot fell a few feet short of the intended boundary but was accepted by Azam at long-off as Shadab got his second. However its was some clean power-hitting by Mohammed and a flurry by Nurse who added and match-winning, unbroken 50 to take the Windies one up in the series. After the first six overs Pakistan seemed to be motoring along nicely with the score well past 30 and the pair of openers looking settled. Pakistan soon raced past their first fifty thanks to the cunning atting by the openers. The Windies skipper would then provide the first breakthrough when Akmal was caught behind by Chadwick Walton off an edge but not before he clobbered five fours and three sixes. 100 in the 20th over. by Nurse after mistiming an attempted big shot. overs to have a go and post a huge total. Azam was not able to get out the blocks this time as he fell to Nurse, caught by Joseph for 13. Meanwhile, the senior Hafeez played a gritty innings, making the most of his familiarity in Guyana as he reached 50 from 68 balls with three fours and a six which helped his team past the 200-run mark. settle in after helping himself to a few boundaries. The two also complimented each other well, adding a vital 50 from 33 balls as Pakistan looked like posting at least 260 with eight overs remaining. off the West Indies captain before falling to the red-hot Nurse, aught at long-on by Holder as Sarfraz Ahmed and Wasim saw out the final overs. Sunday’s match at Providence is expected to have a sold out capacity crowd as the hosts look to take the series 2-0.